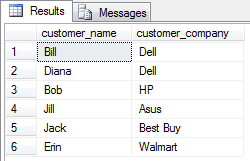 The SQL Distinct clause in the SQL Language allows you to remove any repeated data in a column. 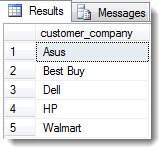 We have 6 rows and 4 columns in this table, but I only want to look at the customer_company column. Now, I want to remove the repeated companies. So if you look at “Dell” in the picture above, you will see that it is in there twice. Notice how we only have 5 rows. That is because the extra/repeated Dell row has been removed. So that is what the distinct clause does, it removes the repeated data elements in a column. 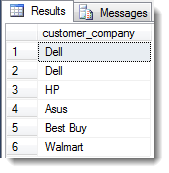 The basis for retrieving data from a relational database like Microsoft SQL Server, Oracle, and MySQL is the SQL Select Statement. You can see that we have a table. You might say it looks like a Microsoft Excel spreadsheet. It has columns: customer_number, customer_name, customer_company, salesman_employee_number. And, it has 6 rows. So there are two keys to the Select statement above. The “Select” word is a keyword that you start your query with. The “*” means we want all columns from the table. The “from” word is a keyword that says you are getting ready to tell the database what table you want. The “customer” word means you want that table. The final thing to notice is the “;”. This tells the database that you are done with your Select Statement. It is optional in Microsoft SQL Server, but it is good to know about. And that is the basics of the SQL Select Statement. Post any questions and comments below. I always read every comment.